The Foreign Policy White Paper calls for enhanced engagement with the Pacific islands, a welcome priority that was echoed in Shadow Defence Minister Richard Marles' recent speech to the Lowy Institute. But the framing of this engagement as a policy of strategic denial avoids some of the complex issues facing the region that will continue to undermine Australia's standing. According to the White Paper, Australia's approach to the region will focus on 'helping to integrate Pacific countries in the Australian and New Zealand economies and our security institutions'. But integration on whose terms? Whose security are we talking about? It is folly to believe that citizens in neighbouring Pacific countries will allow Australian governments to set the agenda. That horse has long bolted. In recent years, a number of bipartisan policies from the Coalition and Labor have arguably damaged Australia's standing in the region. These include the commitment to fossil fuel exports, the expensive and unresolved warehousing of asylum seekers and refugees on Manus and Nauru, and the gutting of the overseas aid program, slashed to the lowest ratio of national income ever recorded. Over the last two decades, trade policy has been a central pillar of regional engagement, but years of negotiations on PACER-Plus ended with an agreement that the two largest island economies have refused to sign (the treaty isn't mentioned in the White Paper chapter on the Pacific). Recent speeches from Prime Minister Malcolm Turnbull, Foreign Minister Julie Bishop and Labor show an important recognition that more can be done. But we should discuss the hard question: what happens if Pacific island citizens reject the underlying premise of our renewed engagement – that Australia's regional leadership is in their best interest? Five questions should be explored further as Australians look to an enhanced role in the islands. What sort of security are we looking for? Have we learnt nothing from our role in supporting the Papua New Guinea Defence Force during the war on Bougainville? Have we not been listening to Fijian citizens who look beyond the military for security? As the Forum launches a regional dialogue on a new 'Biketawa-Plus' security framework, we should prioritise support for actors beyond the defence forces. Former diplomat James Batley notes the White Paper 'sees the region as both as a potential source of, and as a vector for, threats against Australia.' But no justice, no peace. Many Pacific citizens will reject Canberra's call for 'stability' if it means reinforcing an unjust status quo. Just ask people living in peri-urban squatter settlements, angry at the growing inequality in their societies, or independence movements seeking a new political status and cultural independence. Our Pacific neighbours have been debating regional security without putting defence of Australia at the heart of the discussion. We need more work on 'human security' rather than realpolitik 'national security'; yet Australian governments prioritise the latter in funding and technical assistance. As an example, 83% of the $2.6 billion spent on RAMSI went on policing, law and justice programs, despite a call from many Solomon Islanders for greater resources to be allocated to community development initiatives in agriculture, community employment, and women's empowerment. What can we offer to self-determination movements? The White Paper dodges the complex and challenging debate around self-determination in Pacific territories administered by France, the US and New Zealand, as well as in neighbouring countries such as Indonesia and PNG. There is just one paragraph on Bougainville and no mention of New Caledonia or West Papua. Given the White Paper's stated commitment to human rights and a global 'rules-based order', this silence on the right to self-determination is striking. Debates around autonomy or independence will be a central feature of regional politics in coming years. Successive governments in Canberra have already chosen sides in these debates, wary of new nation states being created across Melanesia. But popular support for self-determination will inevitably complicate bilateral relationships with Port Moresby, Jakarta and Paris, as well as Australia's role in the Pacific Islands Forum. The 2016 decision to extend full Forum membership to New Caledonia and French Polynesia amplifies the capacity of the French Republic to intervene in this regional debate. Because the French state controls key legal powers over defence, policing and the military in its Pacific dependencies, Paris rather than Noumea or Papeete will drive policy in the Forum Regional Security Committee and South Pacific Defence Ministers Meeting. This has concerned many Pacific opinion makers already critical of the disproportionate influence by Australia and New Zealand over Forum policy. Do island states really want Canberra calling the shots? In his commentary on the White Paper, Greg Colton suggests that Australia should promote 'the establishment of a Compact of Free Association with Nauru, Tuvalu and Kiribati as a foreign policy priority for the Pacific'. The idea fails the pub test. Would Nauru, Tuvalu and Kiribati would allow Canberra to direct their foreign policy, a core element of any Compact relationship? Pacific countries in Free Association with the US or New Zealand have never taken up this status after being an independent and sovereign state. The US Compact States also bridle at the restrictions of their status, demonstrated by expanding engagement with China, or Marshall Islands' diplomacy on nuclear disarmament. There is obviously scope for an improved relationship with the Smaller Island States (SIS). There have been positive initiatives in recent times, such as the Pacific Labour Scheme that provides greater access to the Australian labour market. But this is a long way short of a trade-off for these countries to give greater control over foreign policy to Canberra. In recent years, Nauru, Tuvalu and Kiribati have used the Pacific Small Island Developing States caucus at the UN to advance policies in direct opposition to those of Australia. Even Nauru, reliant on Australian funding from the refugee detention centres, has supported the re-inscription of French Polynesia on the UN list of non-self-governing territories, lobbied for the West Papuan nationalist movement and signed the Treaty on the Prohibition of Nuclear Weapons. Budget cuts have hollowed out institutions that are vital for our engagement with the region, from volunteer programs to Radio Australia and the Bureau of Meteorology. This is particularly evident with the overseas aid program and climate finance. As Annmaree O'Keefe argued, the failure of the White Paper to seriously address the role of overseas development assistance is a crucial weakness. By 2020, Australian governments must ramp up public climate financing to meet our fair share of global targets, requiring a fivefold increase beyond existing commitments. Neither major party has said where this money could come from, at a time budget papers predict overseas aid will sink to 0.2% of gross national income by 2020. Since the 2009 Copenhagen summit, Australia's climate finance has been drawn completely from the aid budget, so other options are needed. In contrast to larger Asian nations, which benefit from private capital flows, smaller island states will always need public investment. Countries such as France are addressing this challenge, through studies into new and innovative sources of development and climate funding. If Australia is serious about engagement with the Pacific, it must do the same, in order to guarantee ongoing and predictable public financing. What happens when we are not in the room? But new ways of working will involve addressing the contradiction between our global and regional priorities. The White Paper wants to increase 'our exports of high-quality coal and LNG' to Asia but also lead the Pacific debate on climate policy. We can't do both. Marles argues 'the countries of the Pacific expect us to lead.' I'd suggest that in some cases, people in the Pacific want Australia to get out of the way. 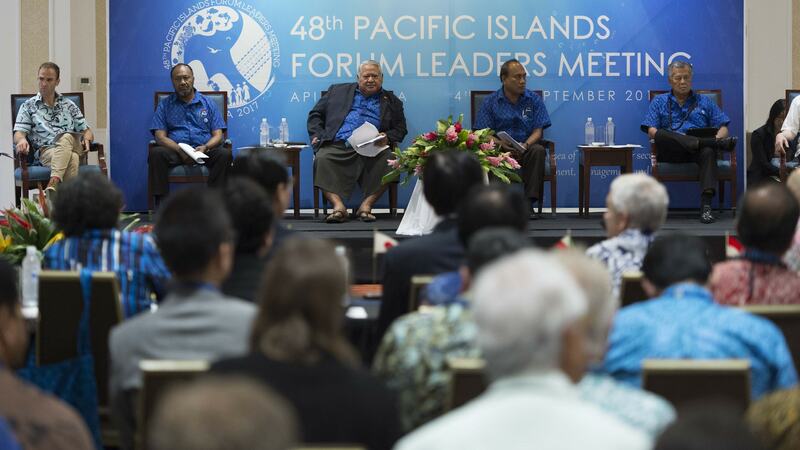 In global summits, DFAT diplomats often oppose Pacific island policies on loss and damage, greenhouse emission targets, nuclear disarmament or alternatives to neoliberal economics. In response, many innovative policies are being formulated and promoted through institutions where Australia is not in the room, such as the Pacific Small Island Developing States, the Alliance of Small Island States, or sub-regional organisations such as the Melanesian Spearhead Group and Polynesian Leaders Group. This new Pacific diplomacy has paid off. Over the last year, Fiji has served as President of the UN General Assembly, co-chaired the global oceans conference and was appointed to the presidency of the UNFCCC Conference of the Parties (COP23). Canberra has provided valuable financial support to these initiatives, which has been welcomed by Pacific citizens and governments. But fundamental policy differences over climate change, trade and decolonisation will continue to complicate regional relations. There will be new calls to transform the regional architecture, as these differences reinforce the growing sentiment that Australia and New Zealand should play a different role within the Forum. Unless we talk honestly about why people are looking to partners beyond Australia, it will be increasingly difficult to paper over contested visions for the future.